Chief Minister Pema Khandu assured teachers of the state that his announcement during Teacher’s Day to grant Group B Gazetted status to PGT teachers serving in government schools will be fulfilled soon. He said a notification in this regard will be released after discussion with the Education Minister. 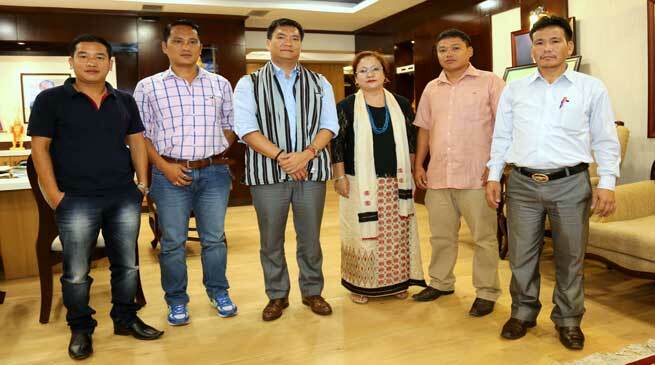 A five-member delegation of Arunachal Teachers’ Association (ATA) including its President Tarh Yaku and General Secretary Tania Hakam had called on the CM Khandu this afternoon with a copy of the memorandum with demands earlier submitted to the Education Minister. Khandu assured ATA that all its demands will be discussed at appropriate levels and the government will take positive action soon. He urged the teachers to be sincere in imparting quality education to students and dedicate themselves to make a better Arunachal. He also said the state government will soon rationalize the posting of teachers in the state. ATA expressed gratitude to the Chief Minister for the Teacher’s Day announcement and requested early notification of the same. The memorandum includes demands for complete bifurcation of Elementary and Secondary Education department in the district and block levels, fast-tracking of promotional process of teachers of all categories and early release of pending salaries of SSA, RMSA and KGBV teachers.